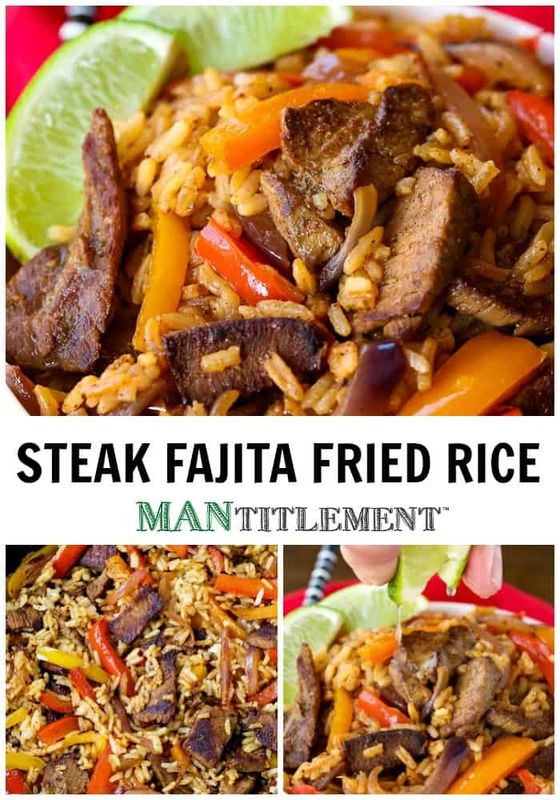 Try this Steak Fajita Fried Rice for a restaurant quality dinner right at home! This fried rice recipe is so delicious, you’ll never order take out again! Ok, so we’re slightly fried rice obsessed around here, but if you’re looking for a classic fried rice recipe, try our simple Chicken Fried Rice recipe or a low carb Cauliflower Fried Rice with pork! Why are we a fried rice obsessed family? For one, it’s super delicious. For two, it’s super easy to make. 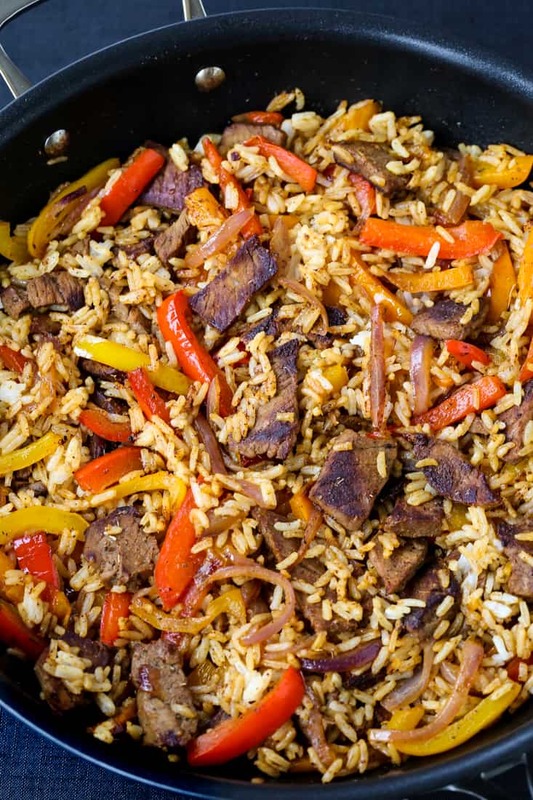 Especially if you have leftovers in your fridge that you might want to use up – usually you can sneak whatever you have into a fried rice recipe. Trust me, we do it ALL the time. At our house we can pretty much put any vegetable or protein into a fried rice recipe and our kids are going to dive in. Fried rice is such a popular dinner recipe for good reason. A few of the reasons I mentioned above but there’s also a few more to mention as well. Making fried rice at home is a much better way to control the amount of oil that you use in the recipe, making fried rice a pretty healthy dinner. So even though it has the word “fried” in the name. We’re really not talking about deep frying the rice in fried rice. It’s a quick cook in a very hot wok – or a large skillet if you don’t have a wok – and like I said before, you can sneak tons of vegetables in fried rice so pile them in. The rice will become firmer this way and the grains will separate making for a more authentic fried rice, not mushy fired rice that no one wants. Another great tip is to grab a couple of containers of rice from your local Chinese take out place and use that instead of making your own rice. 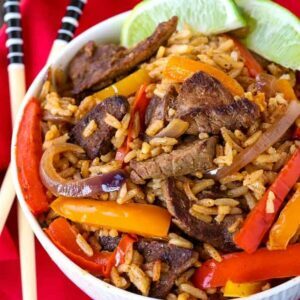 To make this beef fried rice mimic those smoking hot fajita flavors, you do have to get a slight char on your meat and vegetables. So get your wok really hot with some canola oil and let you beef and vegetable get some good color on them before you mix them in with the rice. 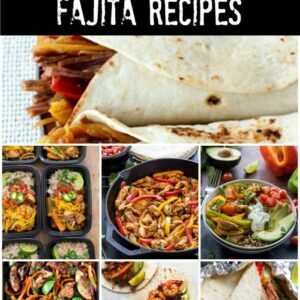 • Broccoli, cabbage, peas, sliced carrots or any leftover vegetables you have on hand! 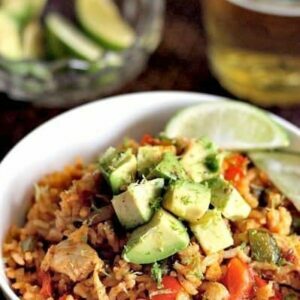 If you’re not a fried rice convert by now, I’ve got some more CRAZY good recipes for you to try! 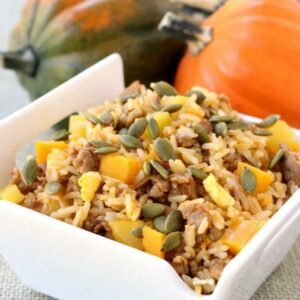 This delicious fried rice recipe can be made with leftover steak or ground beef too! 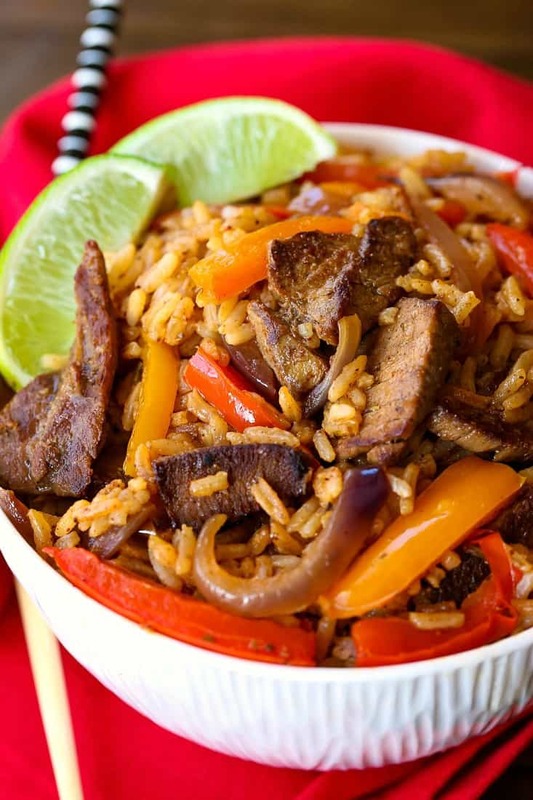 This steak fried rice is perfect for Cinco de Mayo parties or a fun family dinner! Heat a large wok or deep skillet with 2 tablespoons of canola oil over medium high heat. Once the wok is heated, add the steak and separate the slices as best you can. Let the steak sear for a couple of minutes before you toss the steak, then let it sear again on the other side. This will only take about 2 minutes per side if you steak is sliced thin. Remove the steak from the wok and place it in a bowl, covered with foil. Add the pepper and onions to the wok along with another 2 tablespoons of canola oil. Season the peppers and onions with salt and pepper and cook until softened, about 5 minutes. Add the cooked rice to the wok along with the soy sauce, sesame oil and Worcestershire sauce. Toss together with the peppers and onions then taste for seasonings. Add more salt, pepper or soy sauce if needed. 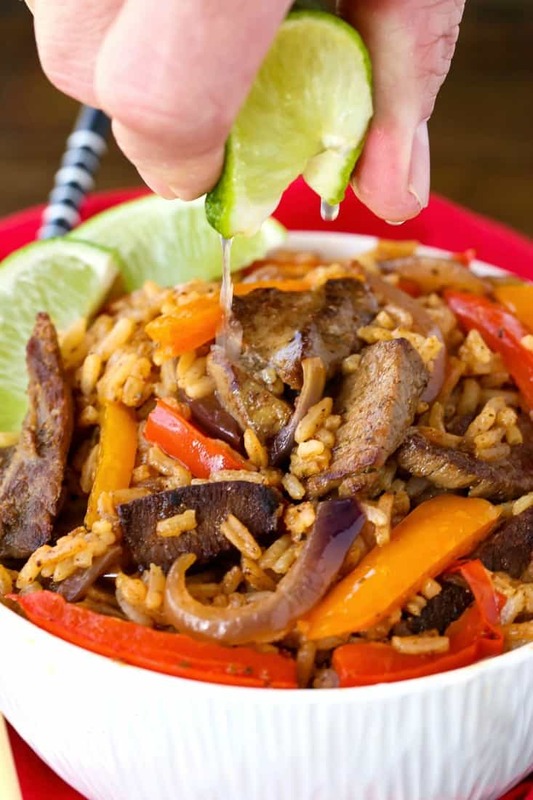 Add the sliced steak back to the wok and toss with the rice, just a minute or so to heat through since the steak is already cooked. Serve in large bowls with a squeeze of fresh lime juice. 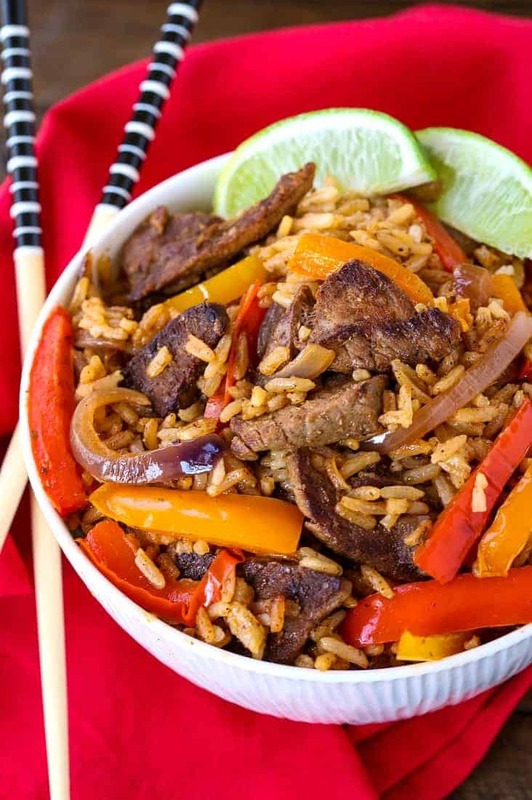 If you are using leftover steak, just slice and add it to the wok along with the seasonings. Cook for 2 minutes just to sear and heat through. You can cook the rice and let it cool on a sheet pan in the refrigerator before using. Also, you can use leftover rice from your Chinese food dinner!